Streamtuner has not been updated since December 2004. and the creator said "I am no longer working on streamtuner. At the time of this writing (December 3, 2007)..." We do NOT recommend that anyone use outdated software. It may not function correctly on a system that has an up to date operating system or it may open your system up to hacking. This is a use at your own risk situation. StreamTuner is an audio application which provides access to over 100 online radio stations in more than 15 categories. You can also use StreamTuner to download audio from the radio stations. Adverts are automatically removed leaving you with just the tracks. As well as providing access to radio stations you can also use StreamTuner to access other services such as Jamendo, MyOggRadio, Shoutcast.com, Surfmusic, TuneIn, Xiph.org and Youtube. StreamTuner is available for most Linux distributions and can be installed from a Debian-based distribution such as Ubuntu or Linux Mint using the apt-get command within the Linux terminal. To open a terminal press CTRL + ALT + T at the same time. You can use StreamTuner by selecting it from the menu or dash made available by the graphical desktop that you are using. The StreamTuner user interface is very basic but the functionality isn't the main selling point of this application. The main selling point of StreamTuner is the content. The interface consists of a menu, a toolbar, a list of resources, a list of categories for the resource and finally a list of stations. The bookmarks resource stores a list of stations that you have bookmarked from the other resources. Internet Radio contains a list of over 100 radio stations across over 15 categories. MyOggRadio is a list of free radio stations. The MyOggRadio website is written in German, so unless you speak the language you would ordinarily have to use Google translate to get it into your preferred tongue. Fortunately, with StreamTuner you do not need to care about the website text as StreamTuner simply lists all of the radio stations. SurfMusic is another website that allows you to choose from online radio stations. The website boasts of 16000 and StreamTuner provides a large list of categories to choose from as well as the ability to choose by country. TuneIn boasts to having over 100,000 live radio stations. StreamTuner provides a list of categories with a large number of stations but I'm wouldn't say there are over 100,000 of them. A market-speak summary of the Xiph.Org Foundation might read something like: "Xiph.Org is a collection of open source, multimedia-related projects. The most aggressive effort works to put the foundation standards of Internet audio and video into the public domain, where all Internet standards belong. To start playing music from a station first of all click on one of the resources (i.e. online radio stations) and then navigate to the category (music genre) you prefer. There are too many to list here but you are sure to find something that you are interested in. Clicking on a category provides a list of stations or in the case of Youtube video links. To start playing a resource either double-click on it or click once and press the "play" button on the toolbar. You can also right-click on the radio station and choose the play button from the context menu that appears. The default audio or media player will load and start to play music or video from the selected resource. If you want to find out more about the online radio station you are listening to click on the Station button on the toolbar. Alternatively right click on the station and choose Station Homepage. To start recording from an online radio station right click on the station and choose "record" from the context menu. This will open a terminal window and you will see the word Skipping appear until a new track begins. When a new track starts it will begin to download. 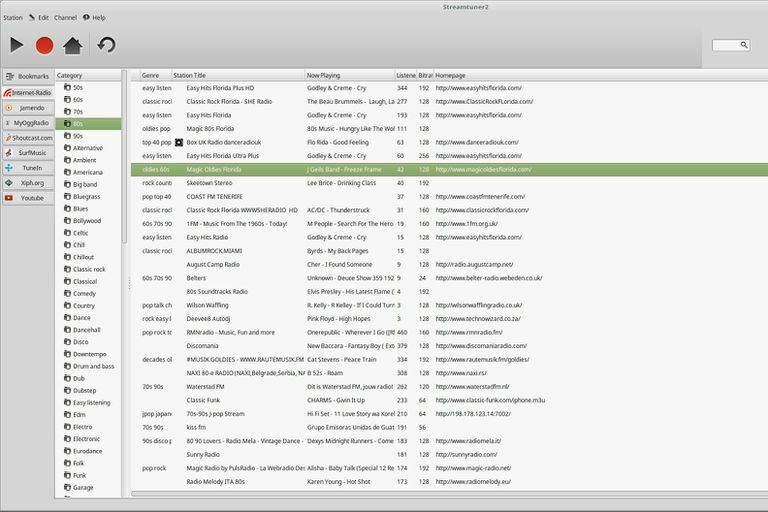 StreamTuner uses the tool StreamRipper to download audio. As you find stations you like you may wish to bookmark them to make it easier to find them. To bookmark a station right-click on the link and choose Add Bookmark from the context menu. To find your bookmarks click on the bookmark resource on the left side of the screen. Your bookmarks will appear under favorites. You will also spot a list of links, This provides a long list of alternative resources for streaming and downloading audio. StreamTuner is a great resource for finding and listening to online radio stations. The legality of downloading audio differs from nation to nation and it is up to you to check that you aren't breaking any laws before doing so. Many of the resources within StreamTuner provide access to artists who are happy for you to download their tracks.